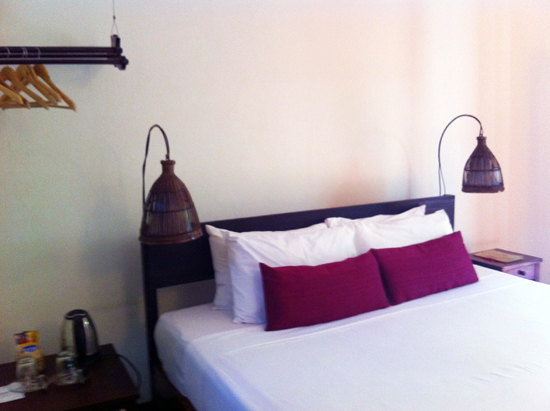 On a quaint sidestreet in the heart of Luang Prabang’s old town is Lotus Villa, a charming small hotel. 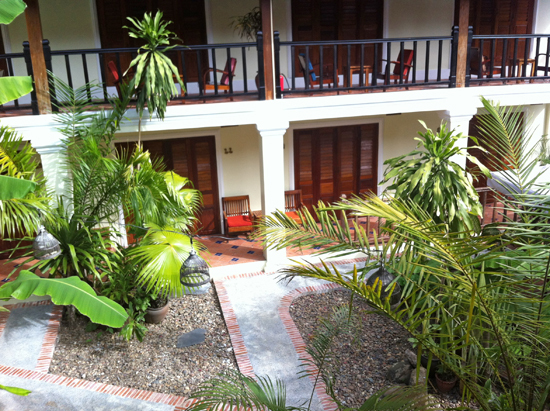 Nestled amid old temples, colonial architecture and beguiling laneways, the hotel’s location is fantastic. You are steps from everything, including the Mekong River, main street and morning alms. With this ambience, you can really get a sense of what it would be like to live in this UNESCO World Heritage Town. Average rating 8.9 from 926 reviews. Though the plain facade makes it look like any one of Luang Prabang’s generic guesthouses, walk through the reception and you’ll discover a central courtyard, a pretty little garden oasis. A welcome oasis in the heart of the historic town. Lotus Villa has three room categories and a suite. All rooms have air-con, posh organic soaps, fridge, tea/coffee-making facilities and in-room safe. Your stay includes breakfast and use of bicycles. 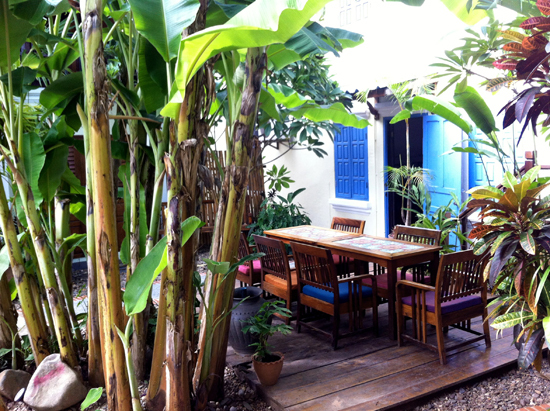 The least expensive are the Frangipani and Waterlily rooms which are similar in style and open onto the courtyard. The Frangipani rooms do not get much natural light but the white walls, white linens and terracotta tile floors keep the rooms feeling bright. The Water Lily rooms are larger, with bathtub, king sized bed and large French doors that open to the courtyard. These rooms are simple but tasteful. The Lotus rooms keep with the heritage architecture and have a completely different feel. 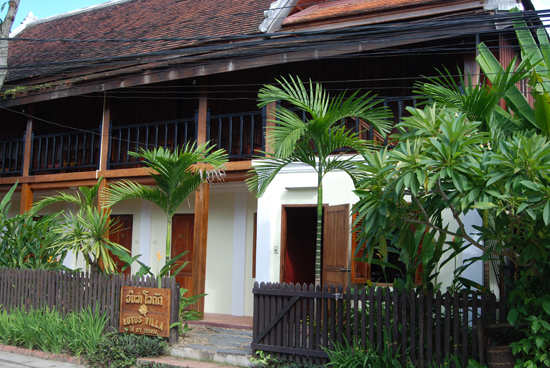 The wood walls and French doors are traditional Lao mixed with colonial details. These rooms have two balconies, one overlooking the courtyard and another overlooking the street. It’ll be hard to pull yourself away from either of these spots during downtime. View from the Lotus Room balcony. The two Orchid suites are expensive and at $155 per night in the high season, it’s hard for us to recommend them at this rate. The suites are certainly large, with a “lounge area” that can fit one additional adult or two children, and it does have some nice details like decorative tile floors and bathtub. However, it’s quite expensive even by Luang Prabang’s pricey standards considering there is no swimming pool, spa or restaurant. And that in general is something to consider while choosing your Luang Prabang hotel and judging value: great location versus having space and those extra amenities. So if you’re looking for a suite, weigh Lotus Villa with others with suites like Le Sen and My Dream. Check rates at Lotus Villa Boutique Hotel on Booking.com.